General Tools flat leg dividers is a useful measurement transfer tool for uneven surfaces; Also great for a variety of uses such as tracing contours and scribing circles into metal. The forged steel legs feature hardened points for precise marking of the work piece; An adjusting screw has a self-seating washer and nut to permit quick and positive adjustment. Hardened and tempered bow springs and fulcrum spools assure uniform tension without side play while using this flat leg divider. This flat leg divider has 6 inch legs and a 6-1/4 inch jaw capacity. General Tools flat leg dividers are frequently used in conjunction with General Tools precision rulers for the most accurate measurement transfer. GENERAL TOOLS - THE PRECISE TOOL FOR DOING THE JOB EXACTLY RIGHT. Offering over 1,000 tools, we re proud to provide tradesmen, craftsmen and DIYers around the world with a broad range of affordable, specific-purpose mechanical hand tools and precision measuring and inspection tools. 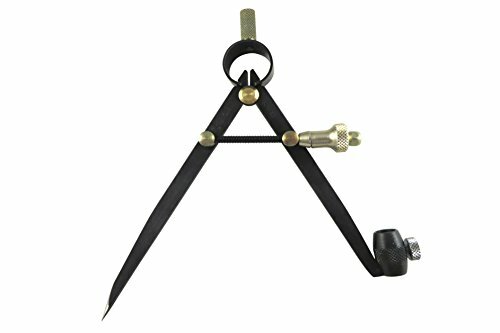 Spring Inside Outside Divider Caliper Set is used for measuring and transferring precise measurements due to the solid nut which can adjust. They are a good tools for machinist, They are made from high quality carbon steel with hardened and finely polished points, more durable and artistic. They have a substantially hardened spring for years of service. You will love it. Made from high quality carbon steel with hardened and finely polished points. One package with divider, inside calipers and outside calipers. Measuring and transferring precise distances to reduce more errors and for a wide range of measurement. 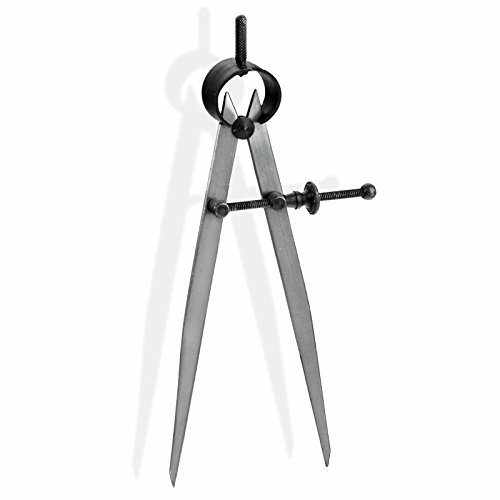 8-inch size make you measurement more distances at a time. Precise fine adjustment due to solid nut. 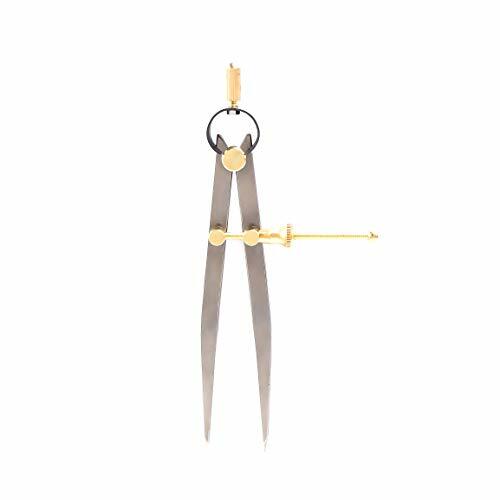 Golden Mean Calipers are used by artists, architects, designers, beauticians, cosmetic surgeons, and collectors of gadgetry. The Golden Mean has appeared in art and architecture for over 2000 years. It is seen everywhere in nature - in the spirals of shells, sunflowers, the human body, and in geometric shapes. The name of this ratio is Phi... and its value is 1.61803399. For artists and designers, use Golden Mean Calipers to create or check layouts or composition - especially useful for human body dimensions. 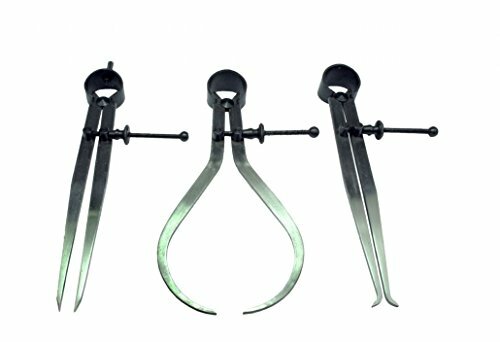 These calipers are also popular for measuring eyebrow dimensions. STAINLESS STEEL - Made from stainless steel with satin finish. DIMENSIONS - This caliper can measure from 9 mm to 220 mm. HAND-CRAFTED - Hand-crafted in New Zealand. 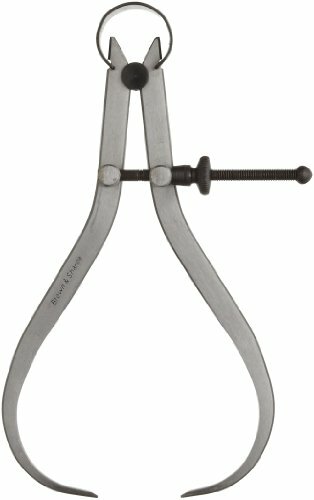 These calipers are most known for measuring eyebrow dimensions. BUILT TO LAST - These calipers have a lifetime quality guarantee. 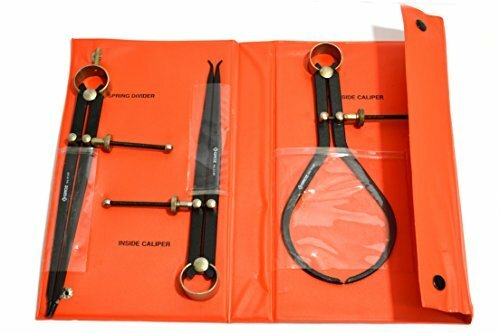 UNIQUE CALIPERS - Golden Mean Calipers are used by artists, surgeons, and beauticians. Made to exacting standards in St Etienne France by Aime Ledin Construction Mecanique Aime Ledin has been making industrial quality measuring tools since 1902. This pair of dividers is made from high-grade carbon steel with hardened and finely ground points. They feature a quick-spring nut for rapid and precise fine adjustments that will securely hold any measurement. The adjustment mechanism is centrally located to assure smooth action. Contains a universal pencil holder. The robust "Yankee" style flat-leg construction makes the unit very durable. They have a burnished and hardened spring for years of service. Feature a black metal finish to resist corrosion. Outside spring calipers are used for measuring and transferring precise outside (OD) measurements. 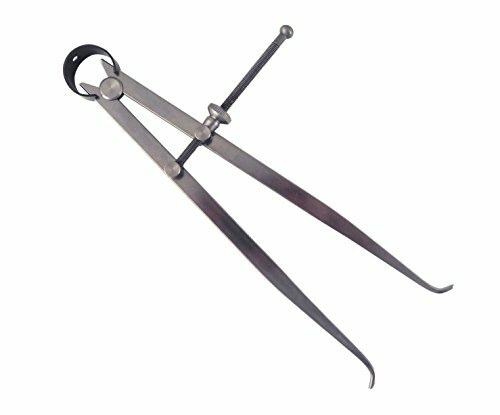 These calipers are made from high-grade carbon steel with hardened, rounded and finely polished points. They feature a quick-spring nut for rapid and precise fine adjustments that will hold any measurement. Adjustment mechanism is central located to assure smooth action. Fulcrum and adjustment mechanism are brass. "Yankee" style flat-leg construction makes unit very durable. They have a substantially hardened spring for years of service. Maximum opening is 10.5 inches or 257 mm. Dividers are used for measuring and transferring precise distances between two points and for drawing arcs and circles. Dividers are made from carbon steel with hardened and finely ground points. Dividers feature a substantial hardened spring fulcrum with a smooth running adjustment nut that is guaranteed to hold any setting. Maximum opening is 8.5". Made from carbon steel with hardened and finely polished points. Made to exacting standards in St Etienne France by Aime Ledin Construction Mecanique Aime Ledin has been making industrial quality measuring tools since 1902. This pair of dividers is made from high-grade carbon steel with hardened and finely ground points. They feature a quick-spring nut for rapid and precise fine adjustments that will securely hold any measurement. The adjustment mechanism is centrally located to assure smooth action. Contains a universal pencil holder. The robust "Yankee" style flat-leg construction makes the unit very durable. They have a burnished and hardened spring for years of service. 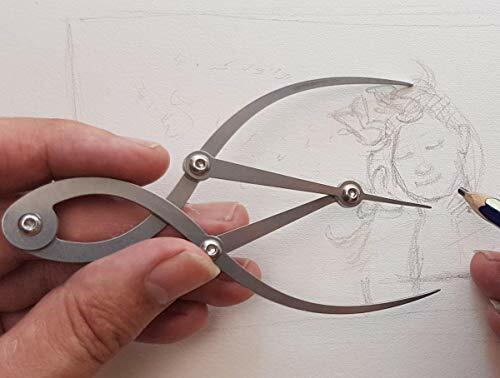 Introducing the spring inside Caliper by powertec this handy inside diameter measurement tool, also called a Yankee style divider or wing divider, measure the distances between two points, transfer measurements and scales, and scribe precision arcs, circles, and other like shapes. The applications are unlimited. These exclusive Flat leg metal dividers for measuring anything are a great addition to any woodworking shop.&Nbsp; easy use, dependable precision to use, lightly squeeze the inside measuring Caliper tool to release tension and slide the specially-machined nut to the rough location of your measurement. Then fine-tune and tighten to Lock in the setting. Proceed to measure the gap with desired scale for accurate determination. It s that easy. Easily transfer The specifications to make sure your projects stay in Spec, to replicate or scale project dimensions, or produce Layouts and Blueprints for future projects. Our divider calipers offer the utmost in an accurate and easy user experience. Great for woodworkers, Woodturners, metal workers, machinists, plumbers, Craftsman, builders, artists, makers, diy rs of all types, and more.Rugged durability Constructed of top-grade carbon steel with solid brass fittings, This durable outside caliber 8 inch provides dependable high performance through many years of use. The Fulcrum, spring and marking/measuring points are precision ground of hardened, tempered steel for flawless scale work and measuring verification, scoring, and transfer, through many years of successful production.Powertec is a leading manufacturer of high quality measurement equipment, hand tools, woodworking machines, gear, and accessories. We are committed to exceeding expectations, while bringing the latest innovation, technology, and product development to the industry. Function: Our premium 6 inch flat leg divider caliper allows you to easily measure, mark and transfer dimensions in a vast array of projects- This divider caliper provides easy essential accurate repeatability - excels in measuring exact distances, and scribing circles, arcs, and dividing lines - great for architects and anyone who deals with scale interpretation and replication. 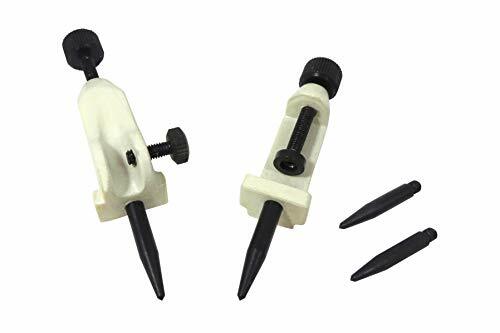 Features: designed with an easy to use, fine-adjustment speed nut, This handy tool ensures the utmost in controlled and precise measurement determination - insures accurate quick fine tuned adjustments - spring tension aids in steady controlled action. Applications: ultra useful in applications in the fields of architecture, woodworking, machining, plumbing, construction, arts and crafts, metal and stone work, and in any other project that would benefit from fast, precise measurement determination and transfer - dividers for woodworking and more. 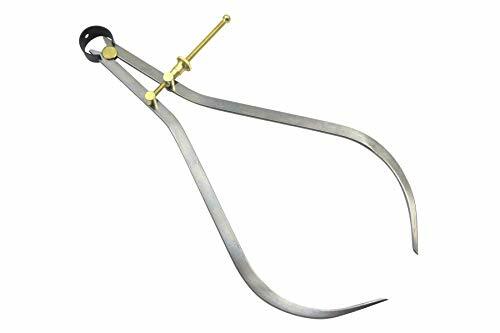 12" 300mm Divider Caliper Wing Compass Metal Marking Circles Machinist Wood SIZE:12" 300mm Compass A drawing instrument used for drawing circles and arcs. Wing Compass A compass, often large, for scribing arcs and circles, with an arced wing that helps to steady the legs in use, and with a locking screw on the arc to hold the legs firmly in position. 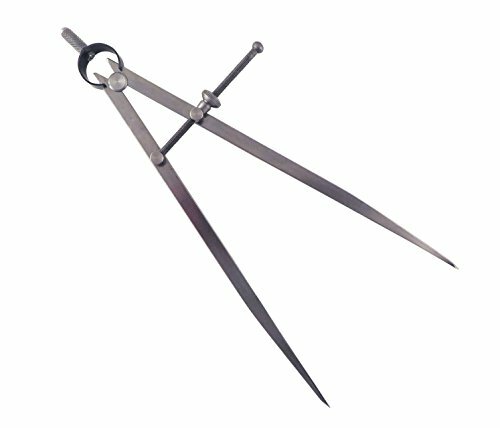 Divider A drawing instrument similar to a compass but with two points, Used for dividing lines and stepping off distances. 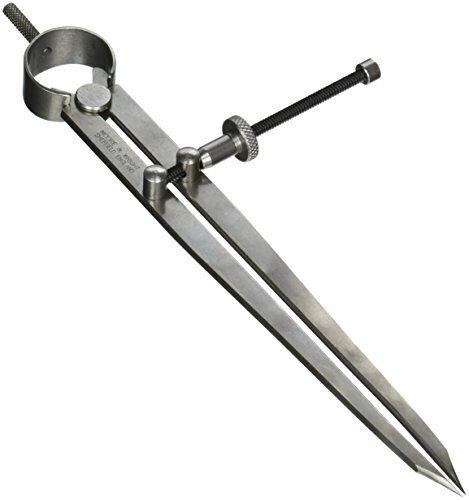 These adjustable clamp on trammel heads are the perfect tool to measure, mark or scribe circles or arcs outside the range of those that could be produced with a standard compass. Unlimited arcs can be made using your custom-length shop-made beam. These heads will clamp onto any wood beam from 3/8 inch to 1-1/4 inch wide. Set comes with two trammel heads, one with an integrated pencil holder that will accept standard wooden pencils.Comes with an extra set of points. Heads are made from tough cast iron. The points are ground sharp and hardened to allow scribing on steel, sheet metal or aluminum. Overall lenght is 4 inches. 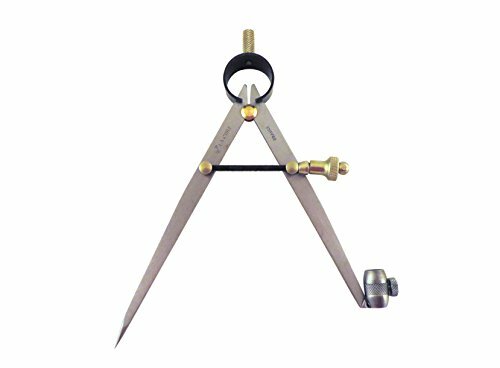 These adjustable clamp on trammel heads are the perfect tool to measure, mark or scribe circles or arcs outside the range of those that could be produced with a standard compass. Unlimited arcs can be made using your custom-length shop-made beam. Set comes with two trammel heads, one has an integrated pencil holder that will accept standard wooden pencils. Comes with extra set of points. Caliper Set, 2 Piece, Inside and Outside with Spring Divider, 8"
Having set standards of excellence for overselves, the constant quest is on bettering them. Stringent systems & processes are constantly monitored to ensure conformance & consistency at all stages of production. All our processes comply with the ISO 9001 Quality System Standard. Having set standards of excellence for overselves, the constant quest is on bettering them. Stringent systems & processes are constantly monitored to ensure conformance & consistency at all stages of production. All our processes comply with the ISO 9001 Quality System Standard. Moore and Wright History...Founded in 1906 by innovative young engineer Frank Moore, Moore and Wright has been designing, manufacturing and supplying precision measuring equipment to global industry for over 100 years. With roots fixed firmly in Sheffield, England, the company began by manufacturing a range of calipers, screwdrivers, punches and other engineer's tools. Spring dividers and calipers (ID and OD) are used for measuring and transferring precise measurements. They are used by multiple professionals. 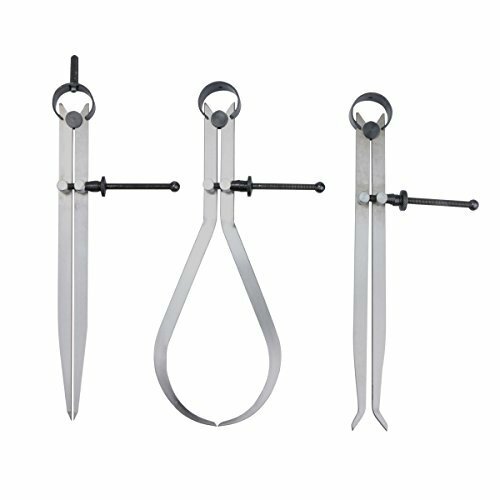 These dividers/calipers are made from high-grade carbon steel with hardened and finely polished points. They feature a solid nut for precise fine adjustments that will securely hold any measurement. Adjustment mechanism is central located to assure smooth action. "Yankee" style flat-leg construction makes units very durable. They have a substantially hardened spring for years of service. Maximum opening is 10.5 inches or 257 mm. 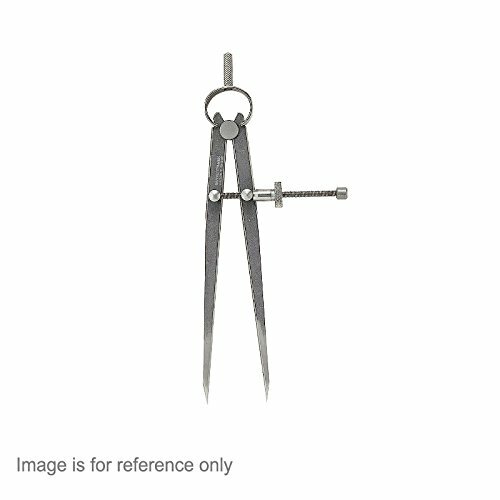 The Brown & Sharpe 599-814-6 spring caliper has a 6"/150mm maximum distance for use in measuring outside dimensions. It has hardened and tempered steel joints, spring, washers, and divider points for durability. The spring caliper has a knurled nut for adjusting caliper point width, and is suitable for applications such as measuring the diameter of machined parts. Inside spring calipers are used for measuring and transferring precise inside (ID) measurements. 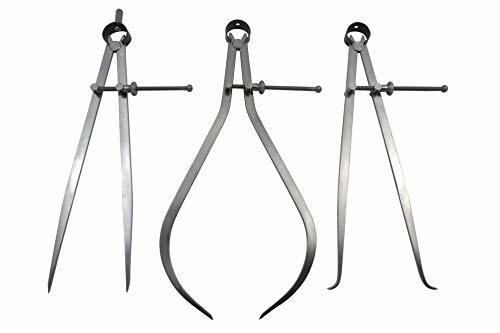 These calipers are made from high-grade carbon steel with hardened, rounded and finely polished points. They feature a solid nut for precise fine adjustments that will securely hold any measurement. Adjustment mechanism is central located to assure smooth action. "Yankee" style flat-leg construction makes unit very durable. They have a substantially hardened spring for years of service. Maximum opening is 8.5 inches or 215 mm. Good quality, 4" economy divider. Easy-to-use with a quick-adjust setting nut. 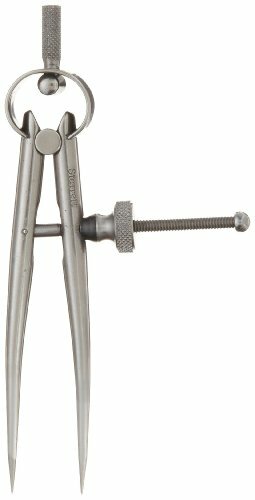 Starrett Toolmakers Calipers and Dividers are the finest tools of their type. Designed for toolmakers and all good mechanics who require finer adjustment and better balance so a more sensitive feel can be obtained. Precision made to rigid Starrett standards throughout.